Today, Rail Forum Midlands (RFM) joined forces with the Careers Transition Partnership (CTP) and the Officers Association (OA), to bring together military personnel who are currently planning their transition into civilian life, and who may be interested in a career in the rail sector, with companies looking to expand/develop their workforce. 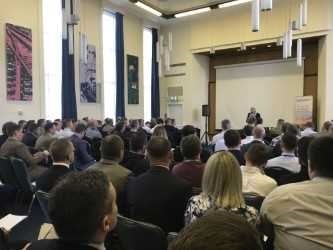 The event catered for all service leavers with a wide variety of backgrounds and began with an introductory session which included a selection of talks from ex-military personnel who have forged successful careers in the rail industry. Delegates were then given the opportunity to network with a number of prospective employers and learn first-hand about the roles available and the types of skills required. 20 organisations exhibited at the event including; Amco Giffen, ATA Recruitment, Balfour Beatty, Bombardier Transportation, Bridgeway Consulting, CoMech Metrology, Direct Rail Services, East Midlands Trains, Ford & Stanley, Loram, Network Rail, Nottingham Trams, NTRS, Rail Operations Group, RSS Infrastructure, Shorterm, Siemens, TXM Group, Xeiad and YRP.